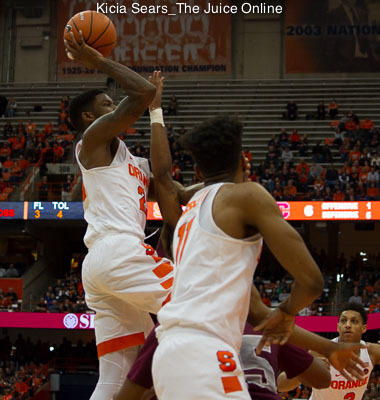 Despite foul trouble and some second half struggles, Frank Howard finished with 18 points as SU escaped against Buffalo Tuesday night. WHAT HAPPENED: Continuing to win in its pre-ACC schedule, SU (10-1) finally turned back an upset bid by the aggressive Bulls (7-4) in the final three minutes of play. UB controlled the tempo in the second half outscoring SU 47-45 to take the Orange to the limit. 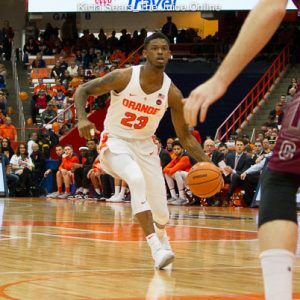 ANALYSIS: Playing only seven scholarship players for the second time this season due to nagging injuries to backup center Bourama Sidibe, and with first half foul trouble (three personal fouls) for Frank Howard, Jim Boeheim mixed up his on court combinations, but every player scored. With UB clamping down on leading scorer Tyus Battle, other SU players stepped up highlighted by Oshae Brissett who has now scored 50 points in the last two games. 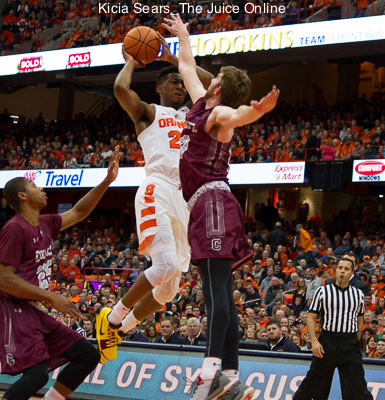 HERO: When Syracuse needed points in the second half, Brissett was clutch. Following up on his 25/14 performance at Georgetown, the freshman big man had a game-high 25 points, including a school-record 16-for-16 from the foul line to stave off the UB upset bid. WHAT’S NEXT: Syracuse continues a four game home stand to end 2017 hosting upstate rival St. Bonaventure Friday night, Dec. 22. The teams last met in 2015, and SU has won 14 straight in the series. The Bonnies (8-2) only losses have been to Niagara and undefeated TCU, and they host Northeastern Wed. night. Game Time: 7:00 p.m. ET / TV: ACC Network Extra.